Most scallops in the stores come in a liquid solution. So you’ll need to drain and rinse them thoroughly first but before searing them in the pan, make sure they are completely dry. You can pat them with paper towels before you season them. To clean fresh mushrooms, the best way is using a clean damp cloth, paper towel or a soft mushroom brush and wiping them one at a time. If you soak them in water or thoroughly rinse them, they will absorb the water like a sponge, and your saute will be soggy. 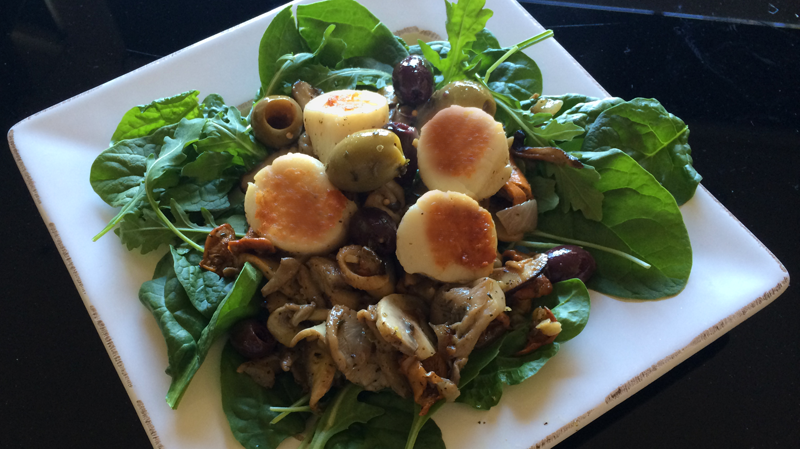 This entry was posted in Food, Gluten Free, Health, Life, Recipes, Soups & Salads, Uncategorized, Weight Loss and tagged Food, Life, Mushrooms, Recipes, Salads, Scallops, Seafood, Weight Loss. Bookmark the permalink. Wow that looks utterly, delicious. I am drooling! So many different kinds of mushrooms! Sounds lovely. I bet this would still be great without the scallops and with some toast. You’re right! It should. I had never tried mixing so many different kinds but it turned out pretty good.